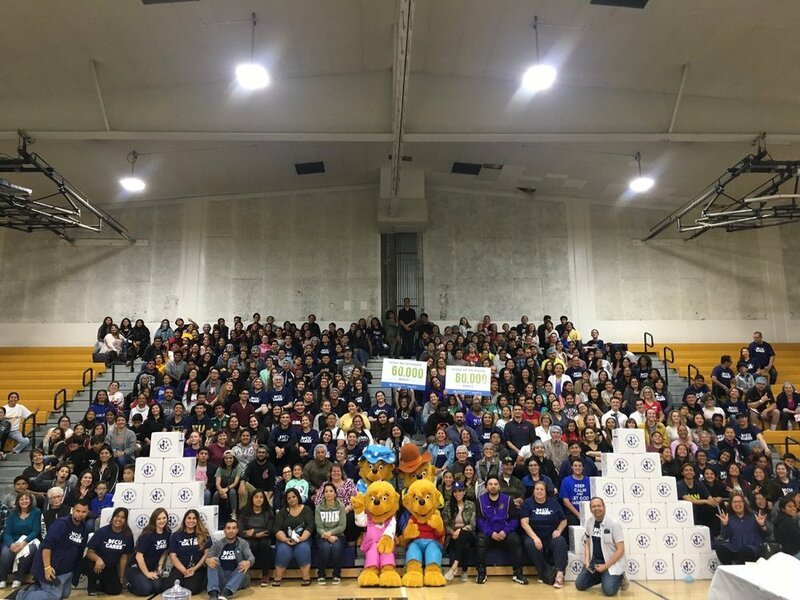 DOWNEY – Over 450 volunteers gathered at Warren High School on April 5 to package more than 62,000 meals for local families in need at Downey Federal Credit Union’s Annual Food Packing event. Since 2014, DFCU has worked alongside generous volunteers to package these meals in an effort to eradicate hunger in our community. “It’s great to see our community band together and help a great cause. We are very fortunate to have such generous members and neighbors” says Ray Mesler, President and CEO of DFCU. A large portion of the meals packaged will be distributed to the Downey community with the help of FoodHelp, a food bank ministry hosted by Downey First Christian Church. Immediately before the food packing event, DFCU held their annual meeting where they presented two scholarships to one high school student and one college student. The high school award recipient, Brian Magdaleno, of Warren High school plans to study environmental engineering. He is currently choosing between admission offers from Harvard, UCLA, UC Berkeley, and other schools. The college scholarship recipient, Sarah Perez, is also a Warren High School graduate who is now studying economics at UCLA.